As the name suggests Stratford-upon-Avon is situated on the banks of the River Avon in Warwickshire. This historic market town on the edge of the Cotswolds is one of the most-visited places in England, attracting around three million people every year from all over the world. Stratford, which grew as a market town in Medieval times, has Anglo-Saxon origins. The name originates from the old English for street and ford. Like nearly all Cotswold market towns Stratford was a major wool centre until the late nineteenth century. It was also a major tanning centre during the sixteenth and seventeenth centuries. 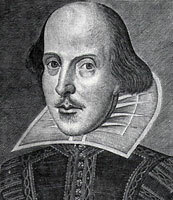 Today it thrives on tourism and theatre, both of which are the legacy of William Shakespeare, who is thought to have been born in Henley Street in 1564. Shakespeare's birthplace is owned and managed by the Shakespeare Birthplace Trust, who acquired it in 1847 with help from the public. Records show that John and Mary Shakespeare, William Shakespeare's parents, lived there from 1552. It is thought that William spent his formative years in this house, which was subjected to a very thorough restoration project by the Trust. Beams made of wood gathered from nearby Arden Forest and fireplaces built with local Wilmcote stone have survived for more than five hundred years. The house is entered through a Visitor's Centre which contains an absorbing exhibition about Shakespeare's life. Shakespeare's birthplace is just one of five properties owned and run by the Shakespeare Birthplace Trust. Shakespeare's mother was born and grew up in what is now known as Mary Arden's House. The adjoining Palmer's Farm has been turned into the Shakespeare Countryside Museum with exhibits demonstrating farming techniques in a pre-mechanical age. Outside in the grounds falconry displays take place daily around a picnic area and adventure playground. Hall's Croft, another Birthplace Trust property, was the home of Shakespeare's daughter, Susanna, who lived there with her husband Dr John Hall. The oldest part of this grand residence dates back to the early sixteenth century and the Hall's wealth can be seen in the generous use of timber on the exterior. This was an expensive way of making traditional wattle and daub houses more secure. Hall's Croft is open to the public and features an exhibition dedicated to Dr John Hall and the weird and wonderful medical practices of his day. There is also a collection of sixteenth and seventeenth century paintings and furniture that would have been typical at the time the Hall's lived in the house. 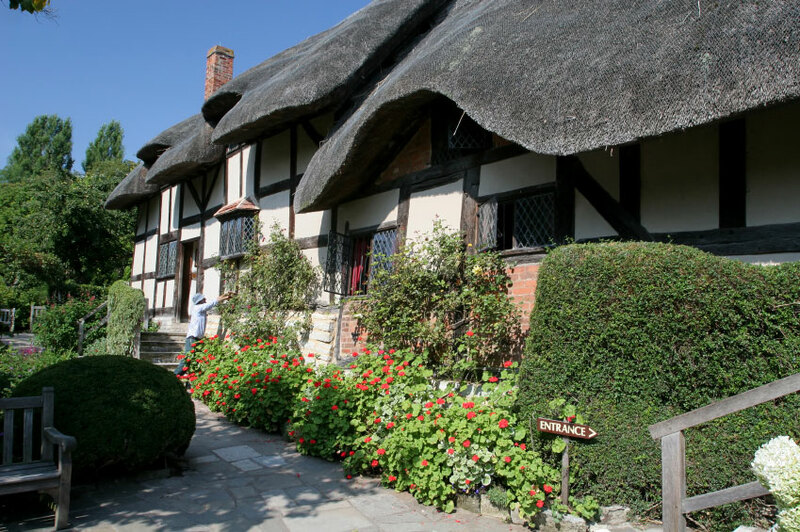 A mile west of Stratford and an easy walk from the centre is the village of Shottery, home to what is perhaps the Shakespeare Birthplace Trust's most famous and picturesque property, Anne Hathaway's cottage. 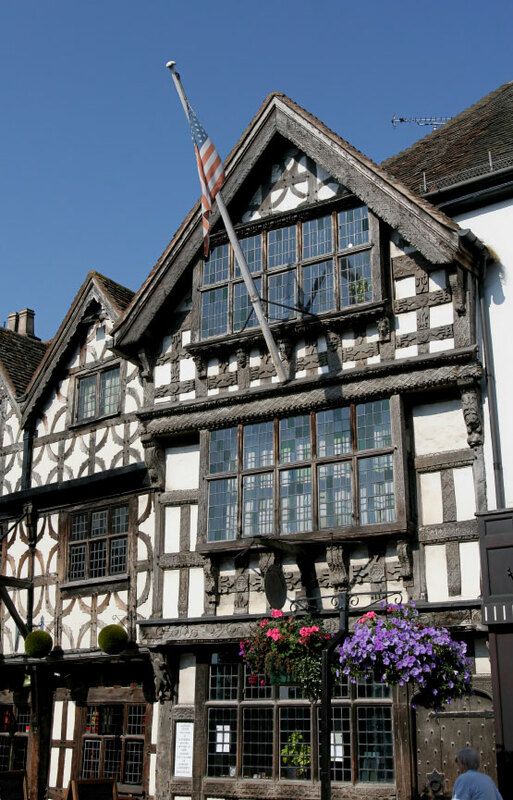 This was the early home of Shakespeare's wife, Anne Hathaway, who came from a family of prosperous farmers. The 'cottage' is actually a twelve-roomed Elizabethan farmhouse, built on a slope and straddling a number of different levels. Parts of the house pre-date the fifteenth century and demonstrate the earliest English house-building techniques. 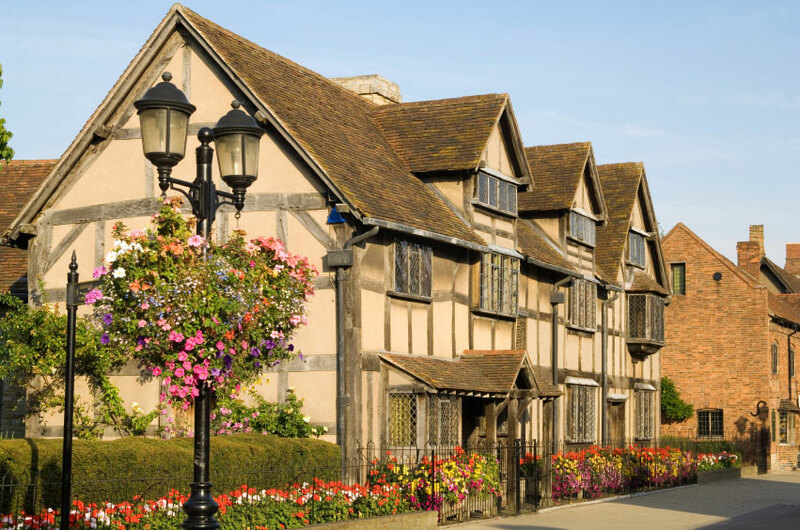 Little has changed on the outside since Anne Hathaway lived there and the low thatched roof, half-timbered walls and latticed windows are an enticing sight for anybody wishing to gain an insight into Shakespeare's world. He may well have walked to visit Anne along one of the many pleasant footpaths that still exist between Stratford and Shottery, across the land that would once have belonged to Newland's Farm. William Shakespeare ended his days on Chapel Street in New Place, which he bought for sixty pounds in 1597. Built by Hugh Clopton, it was the second largest building in Stratford, and the only one made of brick. When Shakespeare died in 1616 the house passed to Susanna, who is thought to have entertained the newly-married queen of Charles I there. Susanna's daughter Elizabeth married Thomas Nash, who owned the neighbouring Nash's House and when Susanna died the two houses were joined into one. On Elizabeth's death the house returned to the Clopton family until it was sold to the Reverend Francis Gastrell. The eccentric Reverend unfortunately destroyed it in a fury over land tax, after which he was hounded out of Stratford by angry residents who forbade anyone by the name of Gastrell from ever living in the town again. Thus what was once the grandest house in Stratford is now an exact replica of an Elizabethan Knott Garden; a sunken garden divided into four 'knotts' by a path and filled with a colourful profusion of flowers, box hedges and Shakespearean herbs. Shakespeare was buried at Holy Trinity Church, one of England's most beautiful parish churches situated on the banks of the River Avon. As well as that of Shakespeare himself the chancel contains the graves of Anne Hathaway, John and Susanna Hall and Elizabeth and Thomas Nash. The chancel is also home to a number of interesting carved misericords dating from the fifteenth century. Shakespeare's gift to the world was also his gift to Stratford. Theatre! 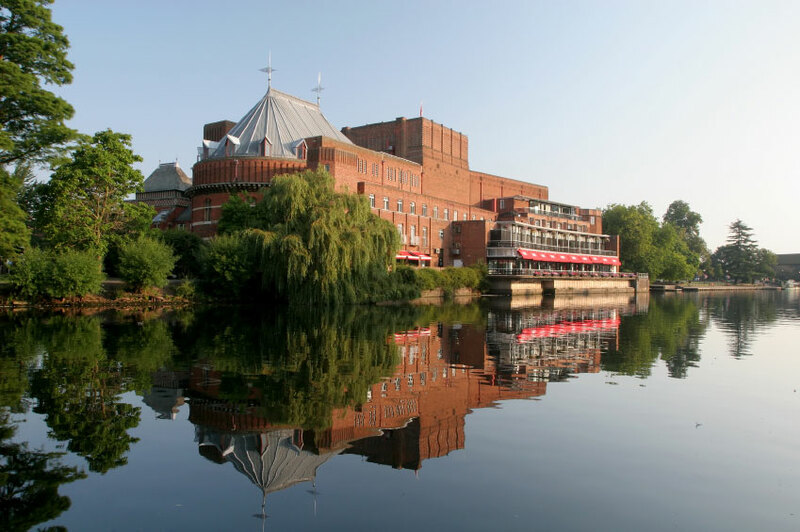 Stratford is the home town of the illustrious Royal Shakespeare Company which was created by Peter Hall in 1961, the same year that he took over as director of the Royal Shakespeare Theatre. The Royal Shakespeare Theatre originally grew out of the Shakespeare Memorial Theatre which was built on riverside land given to the council by Charles Flower in the 1870s. This theatre was burnt down in 1926 and an architectural competition was set up to find the design to replace it. The competition was won by English architect Elisabeth Scott and the new theatre was opened by the Prince of Wales (later to become King Edward III) in 1932. The RST has since been host to scores of illustrious artistic directors including actor Anthony Quayle. Elisabeth Scott's theatre is currently closed for a massive refurbishment project that also includes the neighbouring 432-seat Swan Theatre. The refurbishment is due to be completed in 2010 until which time the temporary 1000-seat Courtyard theatre and the town's Civil Hall will house the RSC. The site of the Courtyard theatre was once the site of the Tercentenary Theatre, built in 1864 to celebrate Shakespeare's 300th birthday. The Tercencentary Theatre was dismantled after three months and the timbers used for house building in the town. Stratford's newest and only privately-owned theatre is the Waterside Theatre, housing one of Stratford's most recently opened tourist attractions. Shakespearience explores the story of Shakespeare using ground-breaking technology in a show that covers both his early life and his life as a playwright working in an Elizabethan-style playhouse. The show, which takes place every hour of every day, also contains highlights from his most popular plays. Stratford is clearly dominated by the legacy of its most famous son, but the constant influx of tourists and theatre-goers has created a vibrant town with shops, cafes, bars, pubs and attractions springing up to cater for the hordes. Visitors to the town can enjoy award-winning guided walks, horse-drawn carriage tours, boat trips down the river and rides on an open top bus. Henley Street, home of Shakepeare's Birthplace, is a major shopping and tourist centre and home to one of the most haunted buildings in the country which contains Creaky Cauldron, a museum of witchcraft and wizardology. The oldest house in Stratford is to be found on the nearby Sheep Street, where the sheep were slaughtered and butchered during the height of the wool trade. Shrieves House claims to have had Oliver Cromwell as a guest in 1651 before the second battle of Worcester. Behind Shrieves House is the Falstaff Experience, an entertaining museum of the macabre, and legend has it that Falstaff the character was based on the inn keeper William Rogers who ran an inn on Sheep Street in the sixteenth century. Harvard House (pictured right) is yet another fine tudor house. Originally owned by wealthy butcher and grain merchant Alderman Thomas Rogers it was some years later that it got its current name. It was through Thomas Rogers' grandson, John Harvard, who emigrated to America in 1637. When he died he left half his estate to what was to become Harvard University. The house was actually administered by the university until recently. It is now part of the Shakespeare Birthplace Trust and provides a home to the Neish Pewter Collection. Running alongside the Avon is a pleasant strip known as Waterside. From here one can access the Waterside theatre and all areas of the Royal Shakespeare Company. Between Waterside and the river are the Bancroft Gardens, whose lawns are filled with street performers in the summer months. For the connoisseurs among you there is a recently-opened Antonio Carluccio restaurant below the Waterside theatre. Perhaps the most famous pub in Stratford is the Dirty Duck. A favourite with actors from the RSC, the pub is plastered with famous faces from Stratford's illustrious past. Other attractions in and around the town include the Stratford Butterfly Farm on the eastern side of the river and the Brass Rubbing Centre, with a unique collection of mainly local brasses.